My modding efforts for the past week have all been working towards my stated goal of getting the game in a more playable state. This was to try to get through as much of the game as I could in its current state. There are still a handful of things that need to be fixed before I can run through from start to finish, but that glue that links all the individual finished components shouldn't be far off. The good news is that I managed to get through quite a lot of the mod before I had to stop. There were, of course, things that I missed, but that's inevitable when you've got an adventure like The Shattered War. 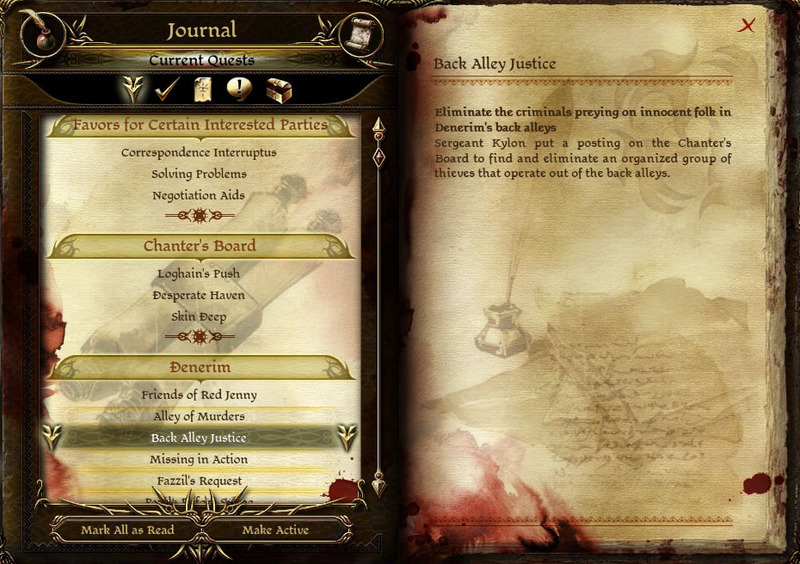 Some choices cut off some content, meaning you can't see everything in one playthrough. It also means there will have to be lots of testing before I can finally call it finished. I was missing stages for couple of conversations - which unceremoniously dumps the player (and the person they're talking to) outside of the walkable area of the level. I'd moved/renamed some resources/levels, which means they were inaccessible when referenced by name by some scripts/variable names. The ability for supposedly mutually exclusive quest lines to be run simultaneously due to some bad logic. I'd failed to set attach some scripts to plots - so when the player completed particular actions, the necessary consequences didn't occur. While this really puts a dampener on a playthrough, I've done this a few times now, so it's one of the first things I check (and subsequently solve a number of issues in one hit). Areas having very quiet ambient sound. To be honest, I'm not actually sure how I can fix some of this, because there's simply no way within the toolset to increase their volume. This is actually one of the most annoying issues, because the ambient sound really makes a huge difference to the overall atmosphere of the area. If anyone with DAO modding knowledge has any idea about this, I'd really love to hear from you. Tweaks to companion approval scripts causing the approval for one of the companions to not work. Some recorded lines of dialogue were uncharacteristically louder or softer than they should have been. There was a nice conversation and then suddenly ONE OF THE CHARACTERS IS TALKING REALLY LOUDLY. A large battle scene where one side simply refused to fight and simply stood there, oblivious to any combat around them. On the whole, I've made some great progress, and should be able to make even more over the coming week. No, I'm not announcing that I'm no longer working on The Shattered War. In fact it's pretty much the opposite. I'll be up front here folks, development has been in "slow time" for the past couple of months. I've been spending maybe an hour a day to work on the mod, and some days I haven't worked on it at all. As such, things have been progressing slowly. Some of the things I've been doing have been very time consuming, but haven't really contributed much to the "content complete" nature of being able to run the mod from start to finish. We're talking dialogue tweaking - the animations, the flow, the voice cuts. It's things like making sure the decorations and appearance of levels is "just right" - making sure they have wind, checking that there are lootable items for players to discover adjusting ambient NPCs and behaviours to make areas "look inhabited. 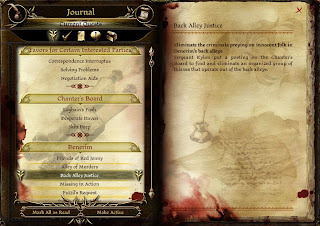 Then there's creating new custom items and giving them their own descriptions and codex entries. All this is fantastic stuff and I feel it really adds to that undefinable "quality" factor of a mod, but it's not great for maintaining developer motivation in feeling like you're making progress towards having it "finished". As such, I'm going to switch my focus for the time being on getting the game "content complete" and making it completely playable without glitches and bugs from start to finish. There are a lot of components to the mod and a lot of choices that the player can make, so I'm going to make sure that those can be followed through to completion. This will mean using "unfinished" levels in a few instances, but in this case I'm going to ditch my perfectionist nature so that the mod can be completed. From now on, I'll be looking to post a weekly update on my progress - so stay tuned for more regular information on the development process!